Kidney transplant is the treatment of choice for end-stage renal disease. The main limitation for a successful transplant is the availability of a compatible donor kidney. The currently available transplant options include: living donor, deceased donor (DD), paired kidney exchange (PKE), and an ABO incompatible donor. PKE can be performed as binaries (swaps), but more patients can benefit if such binaries are extended into longer chains. Transplant laws in India necessitate that any paired exchange has to be simultaneous. This poses a limitation on the chain length in a PKE. Currently the DD registry and the PKE registry function independently. Although the DDtransplant rate in India has improved from 0.08 per million populations in 2013–0.34 per million populations in 2016, it still remains among the lowest in the world. PKE is still in its infancy in this country and in the absence of a national registry, this is practiced predominantly from single centers. In such a scenario, mathematical modeling utilizing the resources from these two registries has a potential to increase the opportunity for a patient to receive a transplantable kidney. We developed a mathematical fusion model linking the two registries and analyzed the outcomes of such a model. Registry data (anonymized) from an established PKE registry were used. For the DDwait-list data, the standard population blood group distribution was taken to represent the blood group distribution of patients in the DD wait-list. All patients with chronic kidney disease V can register into the DD transplant wait-list. Some with available but incompatible donors can register in a PKE registry as well. It is assumed that all patients in the PKE registry will also register in the DD waitlist. Thus, there will be some patients who will register in both the registries. We have modeled the problem in Python Pulp version 3.6.1 with Pulp module. Python Software Foundation. Wilmington, Delaware, USA which is an open source software. The mathematical solver used for solving the fusion model was CPLEX which uses Branch and Bound Algorithm. As seen in [Figure 1], a fusion model was created linking the DD and the PKE registries. The process of kidney allocation is initiated with a DD. In the currently existing scheme of organ allocation, two kidneys from a DD are allotted to the DD wait-list recipients. By the fusion process, the first DD kidney goes to a recipient in the DD registry, to maintain the fairness criteria to recipients on this waitlist. The other kidney goes to the PKE registry and the paired donor of that recipient donates his kidney to the next recipient in the same PKE registry, to create a paired exchange chain. Several such donor-recipient (D-R) pairs can then be added to this chain in the PKE registry. The last donor of the chain then donates his kidney back to the second patient in the DD registry. In this manner, from a single DD, two patients in the DD registry receive kidneys, while, additional patients in the PKE registry also simultaneously benefit. As seen in [Figure 2], to overcome the problem of encountering a positive crossmatch, two recipients are called at each stage of the chain for crossmatch testing, so as to have a substitute ready in case the cross match of one patient is positive. The maximum chain length is kept at 3. To test the efficacy of this fusion model, four different datasets were generated for simulations, reflecting four different settings based upon: The number of pairs in the PKE registry, the number of patients listed in the DD registry, and the number of available DDs. A comparative outcome analysis was performed. To estimate the maximum benefit that can be achieved by the fusion model, an analysis of a scenario where all cross matches were negative was done. A second analysis was then done where 20% of all cross matches would be positive. Two types of comparisons were done across the board. In the first instance, the number of pairs in the PKE registry was constant and the number of DDs was increased. In the second instance, the number of DDs was kept constant and the number of pairs in the PKE registry was increased. We compared the number of possible transplants generated by utilizing the fusion model and compared that to independently functioning PKE and DD registries. It is evident from [Table 1] that there is a gain in the number of transplanted recipients by the fusion model in comparison to the two standalone registries working independently. This gain is further enhanced for every increase in size of either of the individual registries. In [Table 2], it can be observed that even with a 20% probability of cross match positivity, the yield with the fusion model is close to the situation where all cross matches were negative. This was due to the process drawing multiple alternatives at each stage, which reduced the possibility of nonexecution of the chain due to a positive cross match. The fusion model increases the overall gain by enhancing the number of transplant possibilities in the PKE registry. 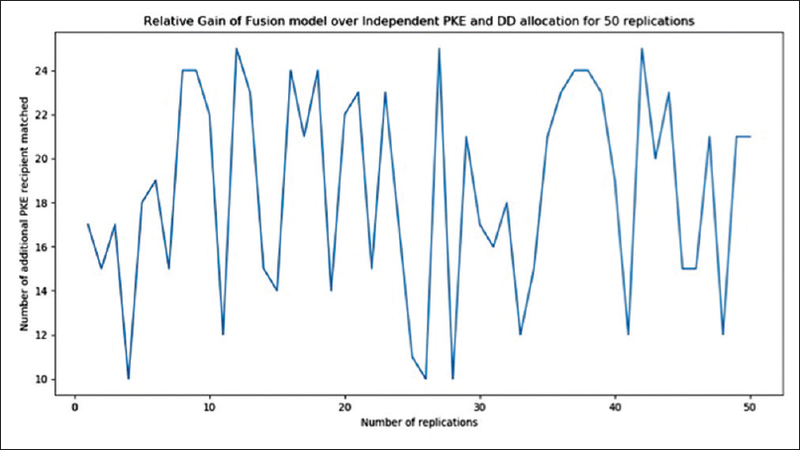 Since all allocations in the fusion model end in the DD waitlist, the numbers of DD recipients remain constant in both these comparisons. For statistical analysis, the level of significance was set at 0.05. The data wer replicated 50 times as shown in [Figure 3], to ensure that statistical tests can be applied. The 95% confidence interval was then calculated for each dataset. These calculations were carried out for the fusion model with a restriction on chain length as 2 for ease of computation. Despite this restriction, the average gain for each dataset was statistically significant (P < 0.05). For longer chain lengths, the gain will be greater with valid statistical significance. As seen in [Table 3], the greatest benefit in terms of the number of transplants are dependent upon two factors; the number of available DDs and the PKE chain length. The blood group distribution of recipients in the DD registry are taken to be representative of the blood group distribution in the general population in India. The blood group distribution for recipients in the PKE registry was borrowed from an established PKE registry, which is taken as representative of such registries in India. This was as follows, 33% for A recipients, 22% for B recipients, 3% for AB recipients, and 42% for O recipients. For their donors, it is 27% for A donors, 49% for B donors, 23% for AB donors, and 1% for O donors. [Table 4] shows the added benefit to O group recipients in the fusion model with a mean gain of 8.29–19.3 (P < 0.05). These are the patients who are at a disadvantage in a standalone PKE registry. Similarly, [Table 5] shows the added benefit to all groups, especially AB recipients in the fusion model with a mean gain of 5.8–18.1 (P < 0.05). These patients are at a disadvantage in a standalone DD registry. When the chain length is increased to 3, the total number of beneficiaries in the fusion model is depicted in [Figure 4] and [Figure 5]. The disadvantaged O group in the PKE registry and the disadvantaged AB group in the DD registry, clearly benefit from the fusion model. For groups A and B, the fusion model is superior to that in either of the two standalone registries functioning independently. The first kidney exchange was suggested by Rappaport in 1986, and the first successful PKE transplant was done by Dr. Park in 1991, in South Korea. This encouraged the establishment of PKE registries in many countries., Many researchers have developed different approaches to find optimal chain lengths in PKE.,,,, A process evolved where such exchanges were deployed nonsimultaneously. In this, altruistic donor-driven paired exchanges were performed in segments, wherein the last donor of a chain became a bridge donor for the next segment. Roth et al. proposed another model, wherein a donor in a D-R pair can donate his kidney to a patient in the DD waitlist and in return, his paired recipient gets a higher rank in that DD waitlist and thus receives a kidney on priority, but at a later date. This was called list exchange. However, the nonsimultaneous nature of this process entails a time lag between the donating and receiving an organ for a given D-R pair. This creates uncertainties and while waiting for a DD kidney, the recipient might fall ill, become unfit, or might even die. Melcher et al. proposed nonsimultaneous chains starting from DDs. Here both the kidneys get allocated to the PKE registry, whose donors would donate to the DD waitlist at a later date. This can create fairness issues for waitlisted patients on the DD registry. The possibility of the donors reneging could disadvantage the DD registry. Futhermore since this is nonsimultaneous, it would lose its applicability in countries like India where paired exchanges should mandatorily be simultaneous. Our model has similarities to the work of Melcher et al. but with certain significant differences. They talk about creating a nonsimultaneous DD chain, which can be executed in parts. Such nonsimultaneous chains can create issues of fairness since if a chain is not executed fully due to a donor backing out, then a recipient on the DD waitlist will be deprived of a transplant. Our fusion model is a simultaneous exchange model as warranted by law. They proposed that both the DD kidneys be used to initiate the PKE chains. However, we feel that this would be unfair to the already highest ranked patient in the DD waitlist who would be bypassed by this process. To maintain fairness, our model has proposed that only one of the two DD kidneys be allotted to the fusion model, and the other kidney be allotted to the DD wait list. There is a gain in the number of transplants possible by the fusion model as compared to the standalone allocation process as currently exists. This does not come at a loss to any particular blood group. As the number of patients in the PKE registry increases, or if the number of available DD kidneys increases, the gain increases proportionately in the fusion model. Executing long simultaneous chains comes with logistical challenges. Several surgical teams and multiple operating rooms are required to execute long chains which may not always be possible. So, a bound on the fusion model chain length is required to ensure the likelihood of successful execution of the chain. Furthermore, DD kidneys need to be transplanted within a finite time span. A major problem that can arise in executing chains within limited time spans are the possibility of encountering a sensitized recipient. When this happens, all the upstream and downstream transplants are at risk. To avoid these kinds of scenarios, we have proposed that more than one potential recipient be called at each stage, so that it increases the likelihood of chain execution. Utilizing the fusion process would result in the first recipient of the chain receiving a DD kidney, while, he provides a living donor kidney to the chain. This discrepancy can raise the valid ethical questions for a life-saving intervention. A similar situation exists in patients on the list exchange. However, the kidney transplant recipients enjoy higher survival rates as compared to patients on dialysis., This explains how a marginal compromise in the graft survival by receiving a DDkidney as compared to receiving a living donor kidney, is compensated by a far greater gain for the first recipient in the PKE registry, in terms of better survival by getting off the waitlist. Furthermore, O group recipients registered only in the DD waitlist would appear to be slightly worse off in the fusion model since one of the DD kidneys will initiate a PKE chain and deprives the DD waitlist of an O group kidney. Whereas, O group recipients in the PKE registry would be slightly better off because they are more likely to receive an O group kidney from a DD than from within the PKE registry itself. Realistically, O group patients registered in the PKE registry, also register into the DD registry. Thus, although a single-O group kidney from a DD gets allotted to the DD registry, the waitlist of O recipients reduces by two. Thus in the fusion model, the number of O group recipients getting cleared on the DD waitlist remains the same as when the DD registry functions independently. Deceased donation rates have not kept pace with the need for organs. Hence, innovative solutions need to be identified. This fusion model can address the need for an organ for far more recipients than the two who would have ordinarily benefitted from a single-DD. The fusion model is a mathematical attempt to address the problem of organ shortage. Dr.NK Hase for his technical help. Kute VB, Agarwal SK, Sahay M, Kumar A, Rathi M, Prasad N, et al. Kidney-paired donation to increase living donor kidney transplantation in India: Guidelines of Indian Society of Organ Transplantation – 2017. Indian J Nephrol 2018;28:1-9. Wallis CB, Samy KP, Roth AE, Rees MA. Kidney paired donation. Nephrol Dial Transplant 2011;26:2091-9. Roth AE, Sonmez T, Unver MU. Kidney exchange. Q J Econ 2004;119:457-88. Roth AE, Sonmez T, Unver MU. Pair wise kidney exchange. J Econ Theory 2005;125:151-88. Abraham DJ, Blum A, Sandholm T. Clearing algorithms for barter exchange markets: Enabling nationwide kidney exchanges. San Diego, California, USA: Proceedings of the 8th ACM conference on Electronic commerce; 2007. p. 295-304. Anderson R, Ashlagi I, Gamarnik D, Roth AE. Finding long chains in kidney exchange using the traveling salesman problem. Proc Natl Acad Sci U S A 2015;112:663-8. Constantino M, Klimentova X, Viana A, Rais A. New insights on integer-programming models for the kidney exchange problem. Eur J Oper Res 2013;231:57-68. Dickerson JP, Procaccia AD, Sandholm T. Failure-aware kidney Exchange, Proceedings of the fourteenth ACM conference on Electronic commerce Philadelphia, Pennsylvania, USA. 2013. p. 323-340. Melcher ML, Roberts JP, Leichtman AB, Roth AE, Rees MA. Utilization of deceased donor kidneys to initiate living donor chains. Am J Transplant 2016;16:1367-70. Schold JD, Srinivas TR, Kayler LK, Meier-Kriesche HU. The overlapping risk profile between dialysis patients listed and not listed for renal transplantation. Am J Transplant 2008;8:58-68.